Blowing up Bits » Extreme Tux Racer — Faster than a speeding penguin! Extreme Tux Racer — Faster than a speeding penguin! May 28, 2014 | Posted in Arcade, Racing, Simulation, Sports | Comments Off on Extreme Tux Racer — Faster than a speeding penguin! Extreme Tux Racer is what happens when we combine sledding, downhill skiing and a penguin. 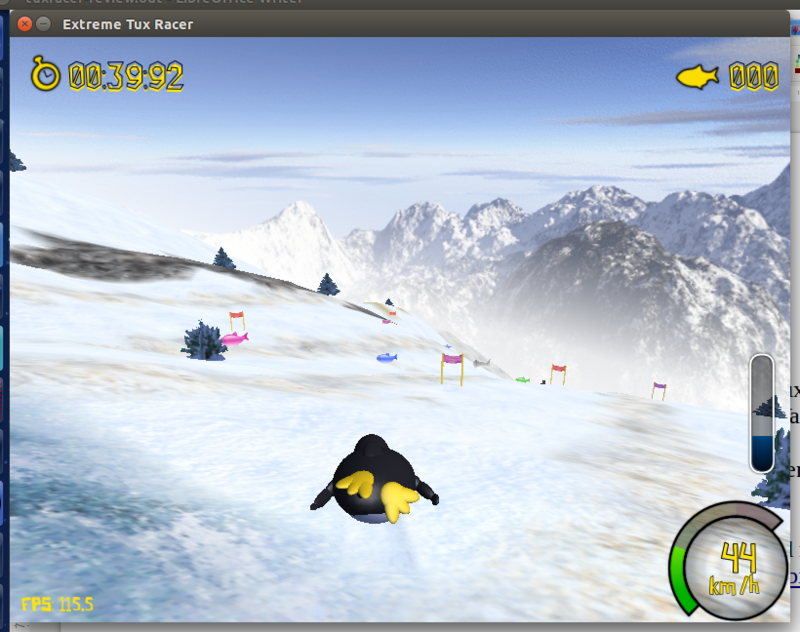 Tux, the Linux mascot penguin, is the star of this 3-D, third-person perspective downhill racing game. We, as the player, guide Tux down a series of increasingly hazardous slopes, dodging trees, sailing over jumps and collecting fish. Each course in Extreme Tux Racer (ETR) has a time limit and a minimum number of fish we must collect during our downward slide. Completing a course with time still on the clock unlocks the next racecourse in the game. As the game progresses, we are introduced to more obstacles, more features and tougher turns. The controls for ETR are very straight forward and we only need concern ourselves with the arrow keys. Tapping the appropriate arrow makes Tux slide faster, slow down or bank left or right. The controls are fluid and I found Tux is responsive, at least assuming our graphics card is up to the challenge. While the game’s concept is simple, the scenery in ETR is quite nicely rendered. The game’s graphics are surprisingly attractive and I found myself re-doing some courses just so I could look at the alternative pathways to the bottom of the hill. I don’t have a whole lot to say about ETR. The game is fun, the Tux character is adorable, the graphics are good and the controls are simple. The courses vary a great deal, ranging from very straight forward to long and complex. Some are quite easy and others are surprisingly challenging. The game is a lot of fun and I suspect it will especially appeal to younger audiences. If you have a child and want to give them a game which is family friendly, eye catching and fun, then Extreme Tux Racer is exactly what you are looking for.